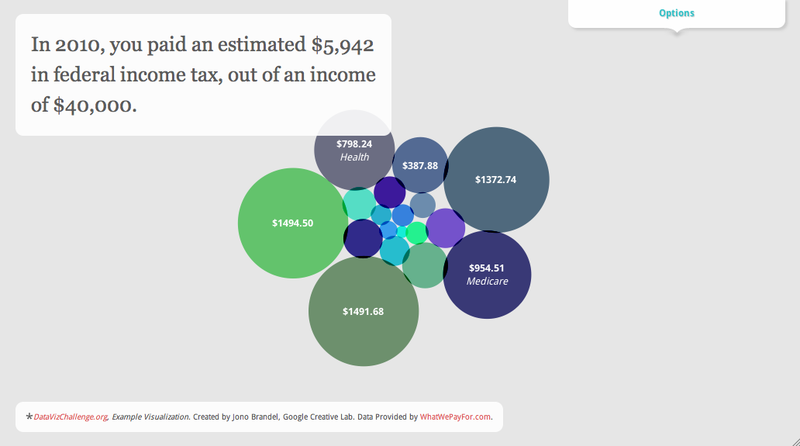 Masable reports that "Google is offering a top prize of $5,000 for its Data Viz Challenge, a contest to see who can offer the best visualization of data about where your tax money goes. The contest, announced on Google’s Official Blog today, is based on a website called whatwepayfor.com, which was created by a couple of developers: Andrew Johnson and Lewis Garcia. But the company acknowledges that its infographic has its limitations. So, Google has teamed up with not-for-profit art and technology center Eyebeam for the challenge. To make things easier, Johnson and Garcia have built an API to let any potential developer access the data. Those interested can enter the challenge at the site referenced above. The contest starts today and ends on March 27. The winner will be announced on April 18, aka Tax Day. Though Google isn’t a company that many people associate with promotions and contests, this is the second such contest this month from the search giant. Earlier this month, Google used a similar promotion to publicize its wedding-planning site.